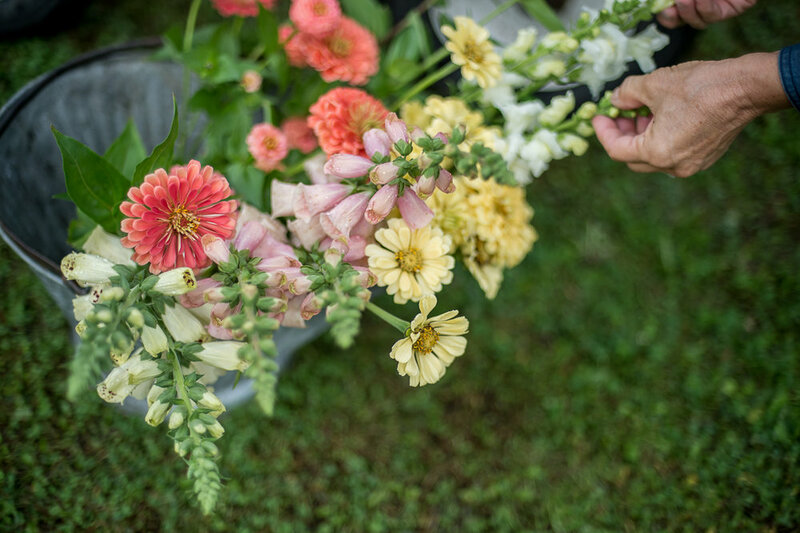 We grow over 75 varieties of seasonal flowers and foliage on our flower farm in the St. Croix River valley. We start most of our flowers from seed, bulb, or tuber and plant them into the ground at the appropriate time. Since we believe in caring for the soil, water, plants, insects and animals in an environmentally-friendly way, we utilize organic growing practices. We do not use chemical or synthetic pesticides or fertilizers - ever. Instead, we nourish the soil with cover crops and organic compost, and feed our plants with natural fertilizers. This means you get the most healthy and long-lasting blooms available. Spring: Tulips, daffodils, muscari, fritillaria, lilac, allium, peonies, stock, columbine, orlaya, sweet peas, baptisia, flowering crabapple. Summer: Lisianthus, dahlias, snapdragons, foxglove, larkspur, delphinium, cosmos, dusty miller, scabiosa, sunflowers, zinnias, verbena, yarrow, cerinthe, celosia, gomphrena, ammi, chocolate lace flower, lysimachia, mountain mint, eryngium, allium, clary sage, coneflower, scented geranium, veronica, frosted explosion grass. Late Summer / Fall: Dahlias, lisianthus, rudbeckia, heirloom chrysanthemums, foxglove, snapdragons, gomphrena, celosia, ornamental grasses, amaranth, ammi, flowering kale, eucalyptus, dusty miller, scented geranium, strawflowers, scabiosa, veronica, trachelium, zinnias, Cup & Saucer vine, hyacinth bean.